This ad has expired ~ no one will be able to browse to this ad anymore. You need to sign in or sign up to contact ad owners. Creating an account is quick and easy! 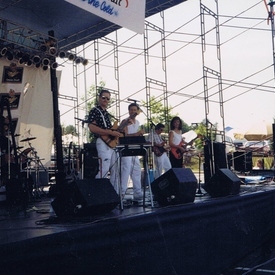 We are 4 out of 6 of the past members of a local rock/covers band that played frequently in the area years back ( Main pic is us playing the main stage at the Fairfax Fair ( Now called Celebrate Fairfax) opening for Atlanta Rhythm Section . We are currently looking for an experienced keyboard player with lead vocal capabilities. You should be able to handle 1/3 of the lead vocals and sing background. We have Bass, Guitar, Drums, Lead female vocalist, looking for Keys to complete the band. We are all seasoned, easy to get along with musicians, capable of putting together a very professional sound. We're all good friends looking to do something fun and low stress...for us, not about the money ( although we won't turn it down..), and once established, we're looking to play out maybe 6-12 times a year... ( parties, small clubs, outdoor festivals). We currently practice at my home in Centreville, Va. Let me know if you think we would be a good fit....Happy New Year!! See more Northern Musician Wanted ads.